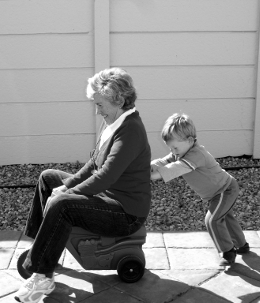 Grandparents often feel left out of the loop and out of pocket as a result, according to a new study from the University of Adelaide. In a report published in the Journal of Family Studies, researchers sought to better understand the impact that regular yet informal childcare has on grandparents' emotional wellbeing. “We know that many families are feeling the financial squeeze, especially single parent families, and they often turn to grandparents as an inexpensive and available source of ongoing child care,” says Cecily Young, a Clinical Psychologist at the University of Adelaide. “Grandparents are usually pleased to be more closely involved in their grandchildren's lives, and they derive great satisfaction from that. Ms Young’s study measured grandparents’ wellbeing in two ways; self-esteem as a representation of positive factors, and psychosocial distress as a representation of the negatives. “Our results showed that grandparents' level of satisfaction with the care arrangements had much to do with their wellbeing,” she says. “The specific details of the arrangements aren't important in and of themselves, what's really important is whether the grandparent feels they've been able to play an active role in making those agreements, that they have been heard, and that their needs are being taken seriously. Ms Young says parents should also be mindful that grandparents are potentially dealing with many issues at once, and it's important to take their other cares and responsibilities, as well as financial pressure, into account when discussing care-giving.